Fall is a great time of year for buying Highlands NC real estate. This relatively quiet time of year offers a less hectic pace which is often more suitable to showing schedules for both properties and buyers.if you have been considering purchasing a Highlands NC home for sale consider starting your search now. 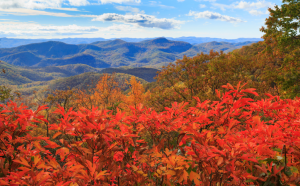 Why is fall a good time for a Highlands NC property search? There is less competition. This means that there are fewer buyers. Additionally this also means that it is easier to schedule showings. Furthermore it is possible that some sellers are more motivated to look at offers considering winter is coming which often equates to a slower time of year for home sales. Bidding wars will also be rare at this time of year. Your Highlands NC REALTOR will undoubtedly have an easier time setting up showings while having more time to devote to you as well. Our team at Berkshire Hathaway HomeServices Meadows Mountain Realty will help you understand everything about buying a home in Highlands NC. We welcome the opportunity to get you up to speed on the market while getting you started on your home search. Let our knowledge and experience serve as your guide to buying Highlands NC real estate. Click here to read “5 Reasons Clients Should House Hunt in the Fall” from REALTOR Magazine.